Of course, if you could, you would prefer to avoid garage door problems altogether. Unfortunately, just like any other machine with multiple moving components, garage doors and garage door openers are susceptible to wear, damage, and other issues that can cause your garage door system to not work the way it should be, leading to unsafe and inconvenient situations. Luckily, RTS All American Garage Door offers quality and reliable emergency garage door repairs that residents in Pensacola, Navarre, Gulf Breeze, and the surrounding areas always turn to in urgent situations. Although we offer 24/7 garage door services , it would still be best to keep your garage door in prime shape at all times to reduce the risk of problems with your garage door at inconvenient times, such as when you’re trying to get your stuck vehicle out of your garage just before you’re about to leave for work. 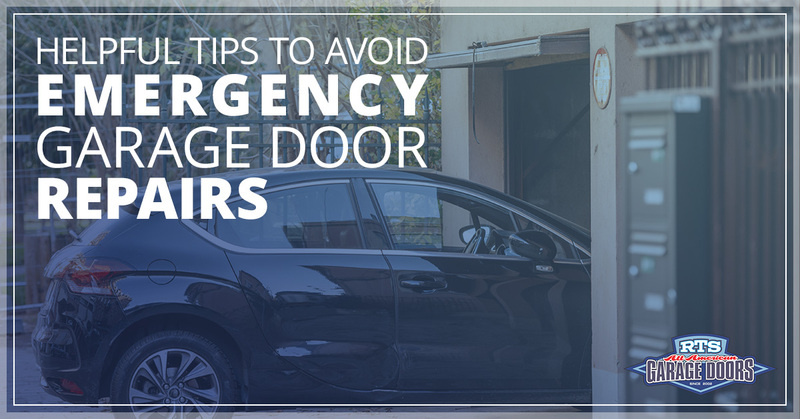 To help you avoid these inconvenient situations, we’ve compiled a list of tips that will help you avoid emergency garage door repairs. No matter how big or small the issue, as soon as you notice a problem with your garage door system, contact a garage door technician as soon as possible. Ignoring the issue will allow it to get worse and cost more in repairs. Garage door professionals will be able to fix the problem quickly to ensure your garage door will be reliable. One of the best ways homeowners can keep their garage doors running efficiently is to regularly maintain them. Regular maintenance will help you identify potential issues before they become to complex or too costly to fix. One of the simplest yet most effective steps in maintaining your garage door is properly cleaning and lubricating the essential parts and components. To best prevent damages and costly repairs, be sure to lubricate the tracks, rollers, weather stripping and hinges on a regular basis. If you notice that you’re having a bit of trouble closing your garage door, the problem could lie within the garage door photo-eye sensors. These sensors are designed to keep your door from closing at inopportune or unsafe moments, however, when the alignment of the sensors is off, this safety feature can become a burden. To keep issues at bay, move the sensors back into their right position, directly facing each other if they are to come out of place. These are just a few of the many things you can do to increase your chances of avoiding emergency garage door repairs. However, it is important to remember that emergencies do happen, and when you are faced with a garage door problem that requires urgent repairs, you can breathe a little easier knowing that RTS Garage Doors offers 24-hour garage door repairs. If you are in need of emergency garage door repairs, contact our team of experts today!